Efficient maintenance of the airport runways is important not only due to aesthetics, but most of all, safety of the passengers. Our Airport Brushes have been designed to provide the most advanced cleaning solutions and thereby contribute to increased safety. Airport cassette brushes work successfully even in the toughest conditions, effectively removing snow and ice from runways. We offer airport cassette brushes on plastic and aluminium profiles filled with crimped wire or PP (polypropylene) compatible with core systems of machines manufactured by ØVERAASEN, Schmidt, Vammas, Fresia, Bucher Schörling, Zaugg and JetBroom-Boschung. It is very important because our brushes fit most types of core systems and are easy to secure. You may want to visit the Airport Brushes product section for more information on how our product can contribute to efficient runway maintenance on your airport. The company operates in accordance with ISO standards. In 2011 it has successfully passed the audit of the largest Scandinavian company managing airports – Avinor, and has become its supplier. TecSolum applies the latest production technologies which protect brushes from losing individual strands. Our unique technology is based on wires filled into cups with a specially designed clip around every single tuft and specially designed bent which holds the retaining wire in halted position during operation. This way our brushes are protected from the mechanical vibrations, which in turn increases the lifespan of our products. TecSolum experts have developed the world’s first innovative cups design to prevent breakage of the crimped wire. We offer a wide and cost-effective range of the most advanced cleaning solutions. 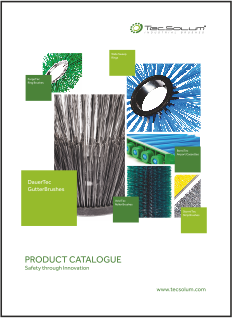 Our product lines range from brushes for runway sweepers such as aluminium and plastic cassettes body systems stuffed with PP or crimped wire (from 0.45 mm) to tufted rings. Bespoke solutions can be also provided. We have been in business for over 10 years and are dedicated to exceeding our customer’s expectations. We offer a personalized approach in an impersonal world by customizing our service to fit your needs. Our Partners: Who has trusted us so far? It is good to know you are not the first! The success of our value lies in the recognition of our customers and partners. We are proud that our airport brushes work on the runways of most airports (including military) in Denmark, Norway, Russia, Belgium, Poland, Ukraine and Lithuania. Below are just a few of TecSolum customers who have decided to implement our solutions in their daily operations.